The events that unfolded upon me at The Krug Park Amphitheater were strange, but I had no idea how bad it would end up. An impulse decision to go see the band The Crickets led me to a crowded concert where drunkenness was everywhere and the music was the least of the concerns of the attendees. The crowd was only concerned with beer from moment one. The slums of St. Joseph got off work on Friday and went straight to Krug Park and started downing red solo cups of Hamm’s like they had been parched on a desert island for decades. By the time the Crickets took the stage they had to deal with drunken cat calls and loud, obnoxious people people and their great, in-depth, politically charged lyrics could have been about farting as far as the crowd was concerned. The band started to play: the audience continued to get drunk. 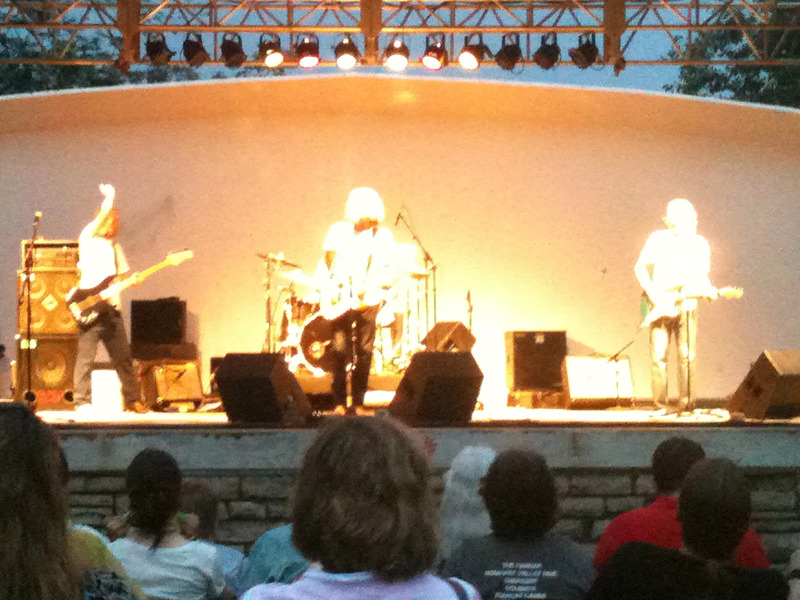 The Crickets at Krug Park Amphitheater, before the mayhem was unleashed. I walked from my home just a few blocks away from the park because I knew parking and entering and exiting the venue would be a nightmare. I walked in the back side where the playground equipment and deer pin are located. Even getting there well before the music started, by the time I paid my $10 to get in the crowd was yelling and beer lines were unreal. More people paid attention to the beer lines than the stage. women were on the shoulders of men flashing each other for free drink which the men gladly provided. Just a few songs into the Crickets set a man I was standing right next to randomly screamed “fire” three time in succession. The crowd immediately began to scramble.He had a thick black beard and was wearing a gaudy gold sweatshirt with and eagle or something on it. I knew there was no fire by this dumbasses deep laugh right before and after him putting away his Hamm’s. The crowd began to push in ALL directions however and I tried to hold my ground. I could hear the Cricket’s lead singer Sara Canfield yell over the PA, “there is no fire! we have more songs” then I turned to see her pelted with a plastic Bud Light bottle in the head then three drunken men rushed the stage as soon as she fell and drug her away to stage left. It would be the last time I saw her. The crowd continued to push in different directions and a sort of violent mosh started that was half fun and half panicked. I found myself quickly on the ground and began to be stepped on. I don’t remember much after that except it hurt like hell on not one neighborly hand tried to help me up. I woke up and it was dark. Police sirens were all around and people were screaming from random spots. Most of the crowd had dissipated and I could see the unmistakable glow from a large fire in the distance in the direction of the trolley’s trail. I came to my feet and immediately ran. I got almost out of the park where people and vehicles were scattered all over realized I was covered in blood. I wasn’t sure if it was mine or someone else’s but as long as I could move I wanted out of that place. I snuck out the back entrance and proceeded to my house. I realized my phone and wallet were missing at this point. I got home and sat on the couch and passed out from exhaustion and from my injuries. I awoke to have a surreal feeling of what had happened a day later. I need to go to the emergency room to get a blood test to see what might have happened to me now but I leave you with one final thought: Why did we spend all this money on revitalizing a family park if if was going to end up this way? The Park was where I went to play as a child and now I saw drunken fights and assaults take place on the same lawn I once had a picnic on with my family. I saw sexual assault and a town overrun with drunkenness. It was a sad sight. I just wish we could have left the park to slowly depreciated on its own accord and not put all of this time, money and effort into it. Today is a sad day. This entry was posted in Concert Review and tagged concert review, Krug Park Amphitheater, nightmare, parody, riots, The Crickets, The Onion rules. Bookmark the permalink. Is this real? Being from the area I just feel like I would have heard about this incident. It is not. It is intended as a call to action to those in opposition of the park’s proposed improvements. It is heavy satire to point out how ridiculous the fears of those people are.